Operation Sealion: How Britain Crushed the German War Machine's Dreams of Invasion in 1940; Leo McKinstry; John Murray, London. 2014. In the summer and fall of 1940, England was faced with the very real threat of a German invasion. Pushed off of the Continent by the German Army, the Allied forces were in disarray having left most of their equipment and weapons in France. With the Allies along the ropes, Hitler hesitated. Before he would send his troops across the treacherous English Channel, he wanted to be sure that the Royal Air Force had been neutralized. Was the RAF the only thing that protected England? McKinstry outlines the dire situation of 1940 as well as some of the measures that the British authorities took to prevent invasion. The British authorities were absolutely "ruthless" in protecting the shores of England. Civil liberties, personal privacy, property rights and international legal conventions were all tossed aide in the struggle for survival. 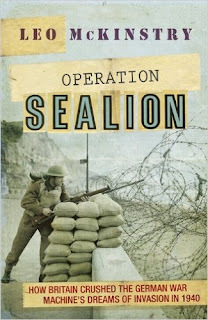 I rather enjoyed this book as it put a different spin on the image of the bumbling "Dad's Army". By September 1940, Home Defence Volunteers were well equipped and a force with which to be reckoned. In Chapter 22, McKinstry touches on some of the spies sent over by the Germans. While I can't speak for McKinstry's other facts, he does make a few statements about the spies which are inaccurate. Apparently from the moment that SUMMER met BISCUIT at High Wycomb (Sept 1940), "not a single spy arrived in Britain without MI5's knowledge". Clear hogwash. Engelbertus Fukken (Jan Willem ter Braak) operated for several months under the nose of the Cambridge Regional Security Liaison Officer (November 1940 to March 1941). Similarly, Florent Steiner arrived in June 1941 but was not apprehended for eight months. McKinstry also noted that Wulf Schmidt (TATE) was injured during his parachute landing and fell asleep on his parachute. Unfortunately that sounds more like SUMMER's landing than TATE's. 4 out of 5 - It was a readable book but the espionage errors were a bit annoying.